"This is the easiest party recipe idea! I came up with this for the Big Game 2 years ago. It is a party hit! Everyone loved it! And it's hassle-free! 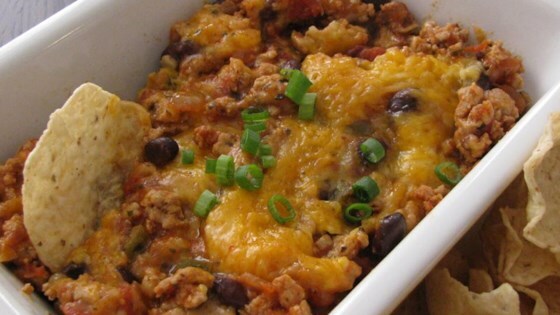 You can alter this recipe by adding virtually anything you enjoy, such as jalapenos, corn, pinto beans, etc. For vegetarians, eliminate the meat and you're set!" Stir black beans and salsa together in a slow cooker set to Low. Break ground turkey into a skillet over medium heat; season with salt and pepper. Cook and stir turkey until completely browned, 5 to 7 minutes. Stir turkey into the black bean mixture. Sprinkle cheese over the turkey and bean mixture. Cook mixture on High for 1 hour. Reduce to Low setting to keep dip hot while serving. This was very easy to make and yummy!